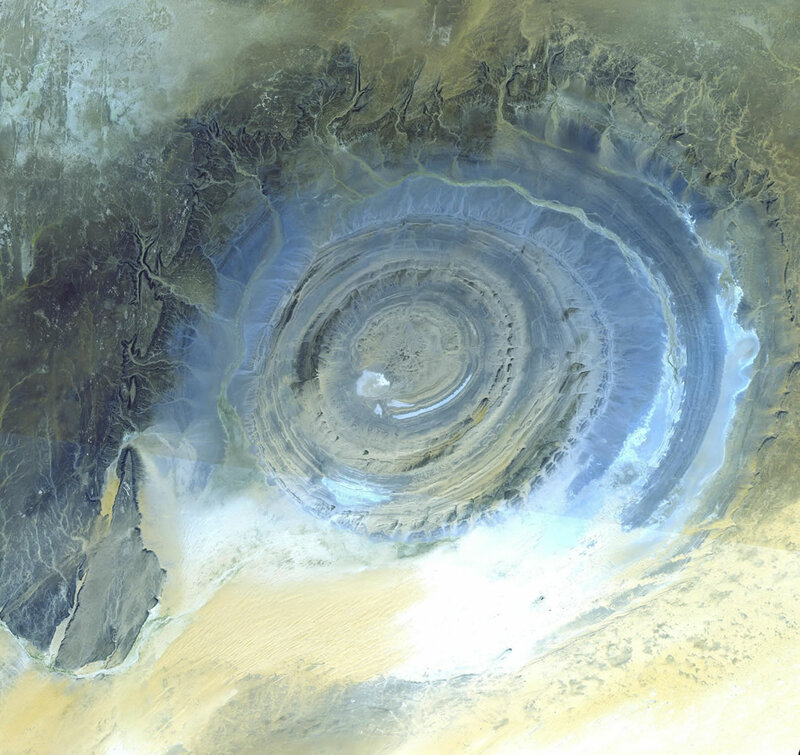 NASA described, “To the right of the International Space Station, the circular feature in the Mauritanian desert is Richat dome. The 24-mile- (39-km)-wide structure was formed by intrusion of molten rock at depth, which domed the overlying rock layers upward. 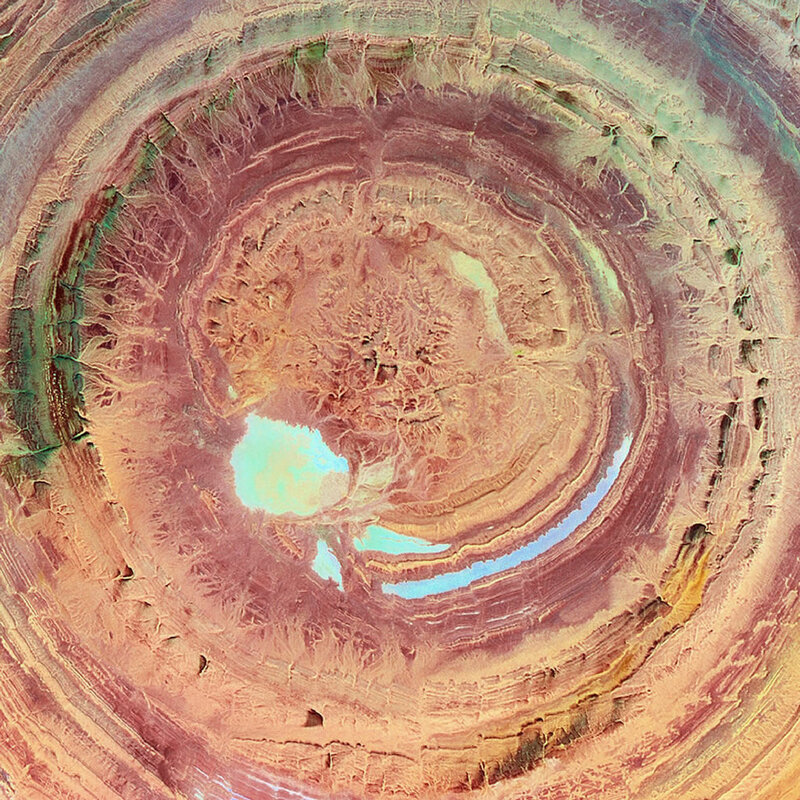 Rock layers of differing compositions weather away at different rates, so that concentric ridges have developed within the structure.ISS and Richat Dome, Mauritania.” Photo #6 by the Image Science & Analysis Laboratory, NASA Johnson Space Center. Just went to Google Maps’ satellite view. Dang, that IS big and obvious! i cant understand how this structure is formed and what is happening to it? The article says the circle is the result of an upheaval (from underneath) not concave like the impact from a meteor. Just my thoughts. There can be no question that it is a standing shock wave. It is well known that it is not a result of direct impact. I have a theory that I have not seen posted elsewhere. I think it is a shockwave as a result of a large object impact at the antipode of this location. 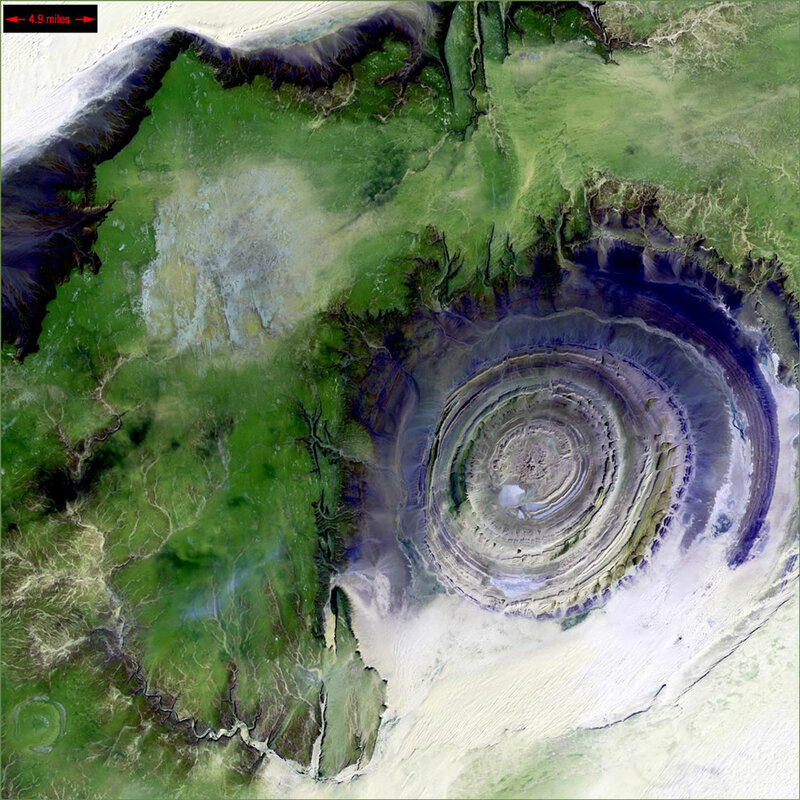 The current antipode to the Richat Structure is East of the Coral Sea. Tectonic plate movements may have shifted the actual impact. This makes the most sense to me. The structure is simply too symmetrical and undulating to be anything BUT a shockwave. If this is correct, it would have formed very rapidly and would have been incredible to witness. 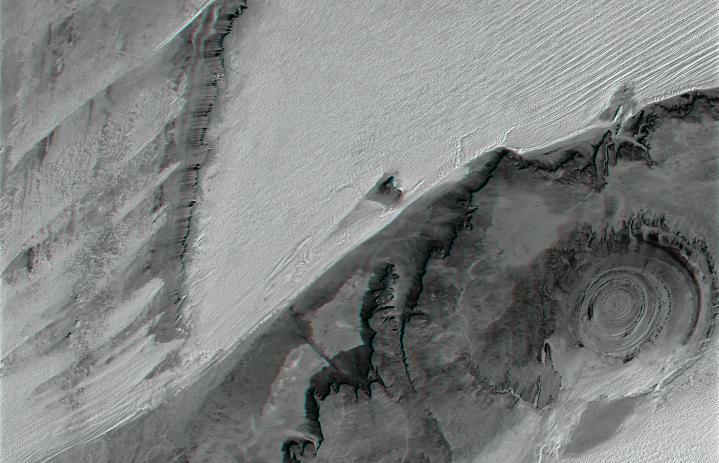 I’m by no means an expert…but If it is the result of erosion, where are the “dome” sediments? Hard to believe that they all blew away and were subsequently partially replaced by sand. If the rocks were not significantly metamorphosed by the presumed heat and pressure of a bolide impact…then maybe the site was under water (i.e., Atlantic) at the time of impact. (Is there any evidence in sediments to support this idea?) The thought being that water would “cushion” the blow and dissipate heat. Not buying the antipodal explaination…the earth is not that perfect of a sphere to produce such a “clean” and relatively small crater. I only posted this as a theory. I cannot think of any other mechanism that would create the symmetry of undulating concentric rings. The shock pattern does not require that Earth be ‘perfectly’ symmetric. For a very, very crude example of energy dissipation in a semi-spherical object, go watch youtube (search water balloon thrown at face). Notice the pattern. Granted this example is not meant to prove anything other than how envergy travels in a semi-spherical mass. Yes, the Earth is not isotropic, but a simulation could be performed (nice graduate thesis). It would be nice to have a CFD model to test. Analogous to our discovery of how Type 1A supernova occur. The default geologic dome theory just doesn’t seem to fit at all. Although one can see erosion effects (dendritic drainage), erosion doesn’t happen with undulating annular symmetry to my knowledge. Then again, I’m not an expert either (I’m Elec Engineer). There are actually models describing damage created by shockwaves at the antipode of where meteors land (for very large ones). End results are often lava flows and other volcanic activity. Nothing quite resembling this. One such example on earth could potentially be the archipelago of Hawaii being at the antipode of the Morokweng crater. such similar observations can be made on mars etc. etc. So far several thousand geologists and other scientists have been all over this formation, so unless every one of them is part of some gigantic plot, it seems safe to assume that they are correct that this is a perfectly natural phenomenon, even if it is thus far not completely understood. Nothing, however, will ever satisfy the usual religious and conspiracy whackjobs, so this will be fodder for their delusions, probably forever. 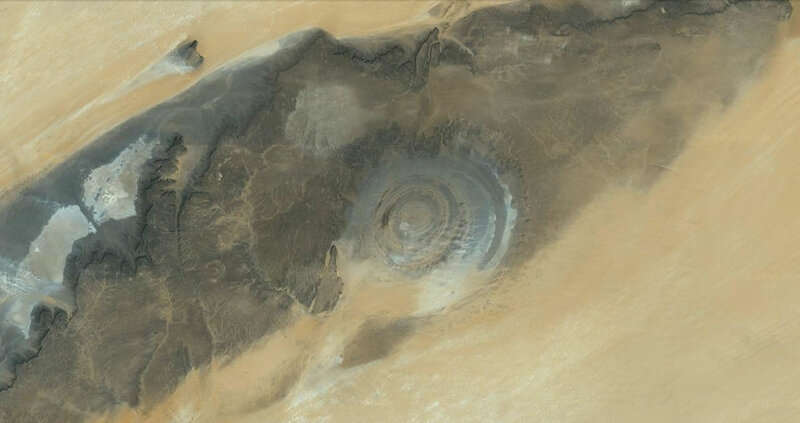 I would suggest that this is an ancient impact site from early earth. Why is their a lack of shock metamorphism over the entire planet? The entire planet was created by a blitzkrieg of meteors and this feature I would suggest is much older and initially larger then the geologist are giving it credit. This is rock that was heated and fused at a depth below the impact crater. The original impact crater has completely been eroded away over the last 4 billion years and all the remains is the fused rock directly below the impact crater. Geologic movements have undulated this formation numerous times and this has caused it to bow into a convex shape. That would be my thoughts, as worthless as they may be. No, that would be USA’s president Obama. The Great Wall of China is the only man-made structure visible from space. I had never see this natural structure until today and it is amazing! What about it being a wortex generated by dominating winds in the area? 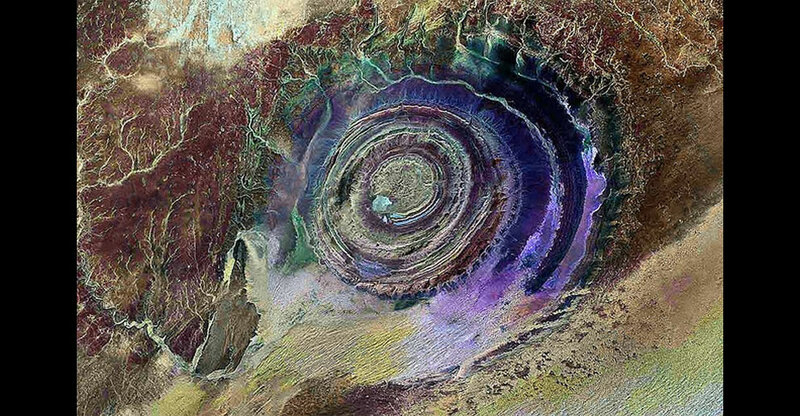 Marrakech (Morocco) in baltic languages mins Eye of Earth Mother- MARA AKIS. I think people know this place in Mauritania from archaic times. I believe it was indeed an impact from space. The velocity at impact was at a snails pace by todays meteors. The area may well have been submerged at the time. Much older than we imagine. It was moltened and soft. It did not vaporize but spread in the configuration of what looks like the eye’s well or socket. Some of it folded over and created the ridge on impact due to the angle of travel. I wonder if a slow squishy impact could create quartzite. I suppose it just takes heat and pressure. Where would a small slow traveling molten object come from 500 million years ago? I recently learned that the Sahara Desert in Africa was once lavish and tropical. Due to the weather patterns changing. The northern area of Africa was not always a desert. About every 2,000 years this could change. 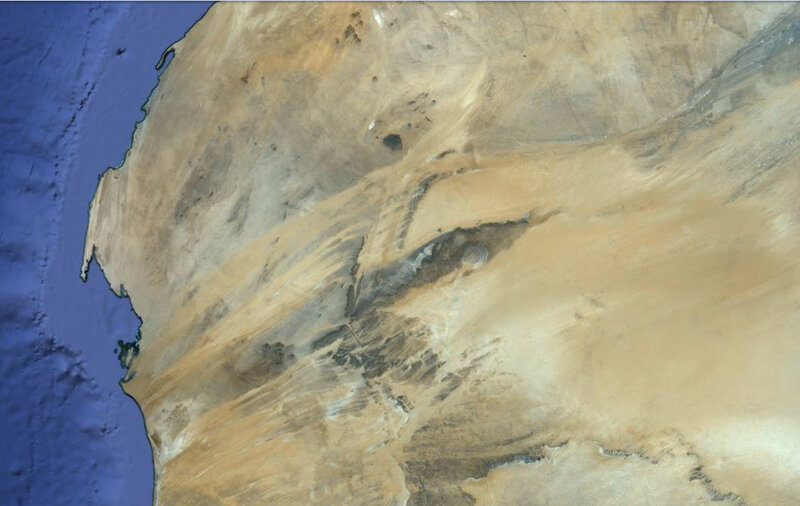 They have found mass quantities of water under the Sahara and are currently pumping the water out. Eventually it will run out but by then, who knows, the weather pattern may change again. 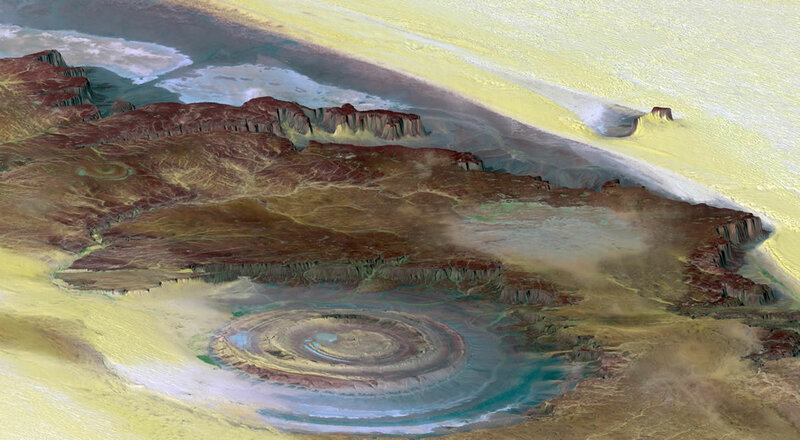 If this happens in the Sahara over and over, going from one extreme to the next, I can only imagine how that could have formed the eye. I wonder if there are mass amnounts of water under that area. That is my best guess in layman’s terms. If it was not so costly, I would love to fly over the Earth and see this part of Africa for myself. 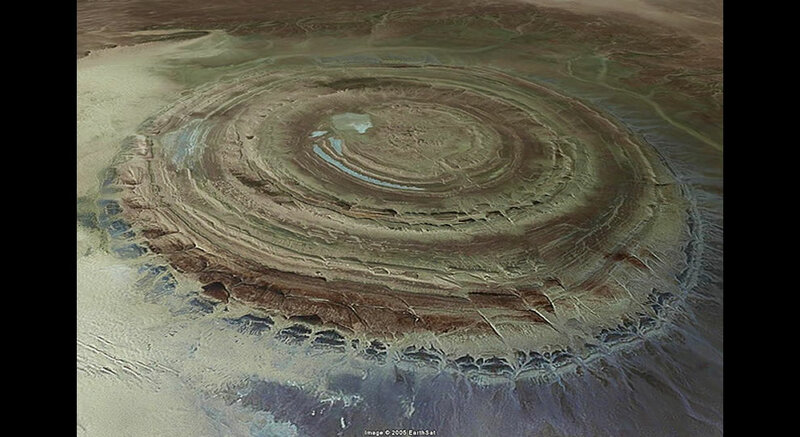 I have been to Africa, but not to view the Richat structure. People, this is an eroded anticline, the lack of shock metamorphism rules out an impact crater. I saw this from a private jet aircraft on a flight from Canary Islands to Lagos in 1981. I guessed a meteor crater and thought I should have heard of this crater but had not. 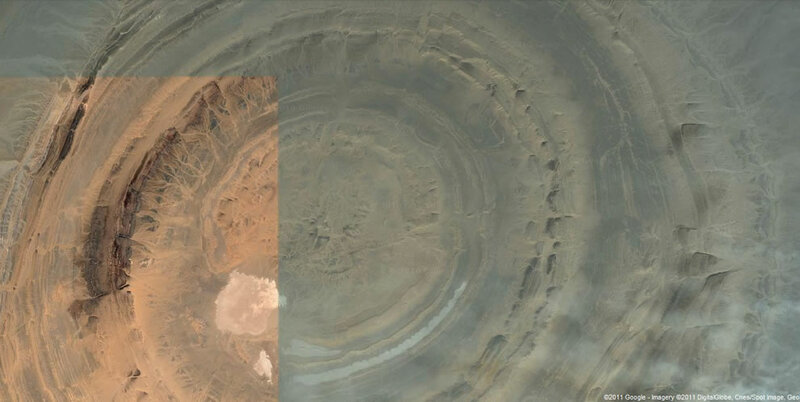 Years later I remembered this observation and did a google search for “crater west africa” and found this. I recognized the very circular shape immediately. I was flying a 35000 ft and realized it was 10’s of miles across. I like the theory of shock wave impact from meteor strike on opposite side of earth, but have no expertise to comment. Looks like a crash landing site. From what exactly? That’s an interesting thought. This is in reference to the “Eye of the Sahara”: When I was in the US Air Force (1970-1990), I was part of a C130 flight crew the first 8 years of my career. I saw many “unusual” sights and strange phenomenon” from the air. At that time, we were given to not discuss any strange sightings with anyone. During a flight is support of the Sep 1974 “King Grain Operation” (Google) to Africa from the Canary Islands, we sighted a very unusual sight. WE were flying between 15K and 20K feet. C130’s are low flying aircraft. We say a rock formation that appeared to be 2 circles of rock formation out in the middle of nowhere. Our navigator checked the map and found nothing on the map. We did not know nor had any idea on what it might have been. For the past 38 years, I had been wondering what it was we flew over. I had been searching for all these years. Then our new technology “Google” came. 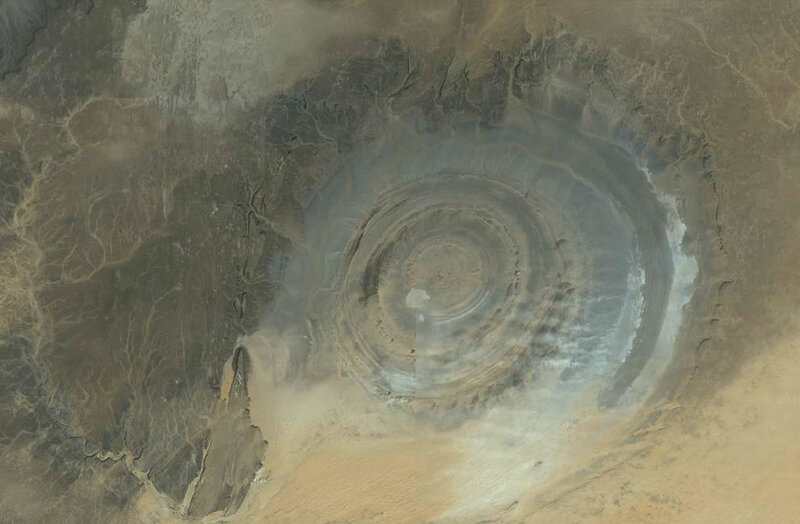 I just saw this “Eye of the Sahara” that the space lab had found during one of their fly over. We saw this rock formation many years before this finding came out. I feel better that we were not the only one that had seen this but we are still wondering what it is that caused this. There is one more sighting that I am still wondering about and will post when I ever I do find out what that other sighting is. Many mysteries of our earth. People. I guarantee this is a meteor impact site. I’ve been working for 10+ years on a method to recognize impact sites. I discovered “Kebira”, in east Africa, almost a year before the people in Boston announced its’ discovery. “Wells for Darfur”? What do you think that underground lake is in? I believe I have also discovered where the moon (?) hit the earth, causing earths wobble AND causing the moon to be heavier on one side (and non-rotating). “The eye” is “bulging” up?? Look at craters on other planets, etc., with lower gravity…some bulge up. Even though the planet is MADE OF impacts, no one (experts) will listen, unless you have “papers” (a degree). You know meteor strikes are mineral concentrators, right? Like the Russian quadrillion diamond discovery last year (announced). I have SO VERY MANY re-definitions, and sites of likely riches, it blows my mind that “educated” people seem uninterested in it! And I’ve tried a few! What do you think the “establishment” originally thought about the existence of individual fingerprints identifying each person? How about “bloodspatter” “technology”? You know it took 55 years for continental drift to be proven correct? The discoverer, who, no doubt, took a lot of …guff…was, of course, DEAD by the time the “experts” came around! How about this…why DID the Mayans (and others) suggest humanity learn to get along, in order to save the earth from another destruction. Could it be that, if we weren’t destroying each other, we could afford to defend the planet from annihalation? Maybe so. It really, really does look a lot like an eroded dome though… I’d love to see a map of the different rocks, to see what they were. Imagine building up a dozen layers of clay or cake in a dome shape, then flat slicing across it. These domes are everywhere (famous one across the UK) – but I’ve never seen pictures of such a circular one. (Perhaps a perfect bubble of magma pushing it up from below). Plus, the desert there is perfect for slicing everything flat. The other thing it could be is a very neat volcano sliced flat – but I guess that would have been obvious to the geologists. Plus a volcano would have had a hard centre that would stand up like a tower. Or it could just be evidence of a UFO landing……. BTW, people claiming that its an impact creator are incorrect. Scientists have found no evidence of an impact at this place. A salt or shale diaper? Looks like a sinkhole that stopped halfway and the was eroded, over and over. I agree with the low velocity impact idea. However, I think this could be the landing site for a spacecraft. What better place to park the big (round)mother ship than in the Sahara? Could this be heat-melt from above the rock? 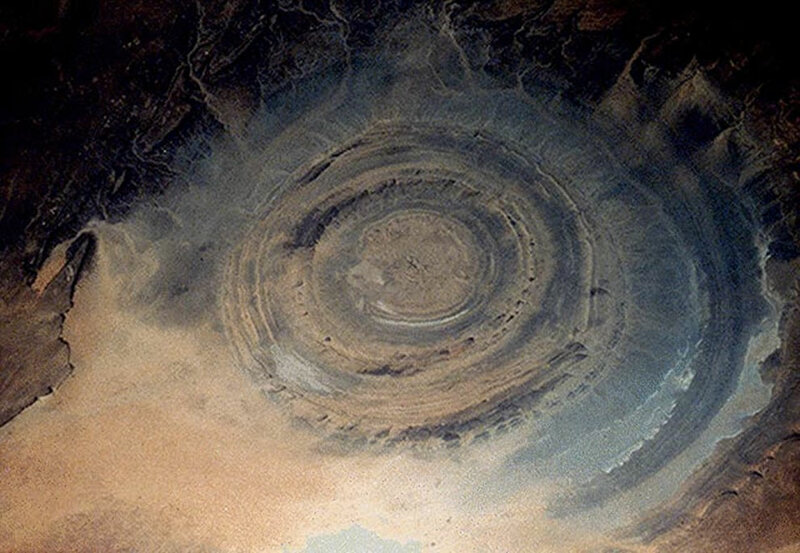 According to me is the “Richat structure” from the remains of a huge Vortex, with in the Centre a connection with the groundwater system, since I suspect the sahara once a large lake. Looking at it, the first thing that comes into my mind is ‘a bomb’. Probably this is where the antediluvians detonated a ‘very high energy’ bomb. This has to be it’s epicenter. Nobody knows what it is. There are other places like this. 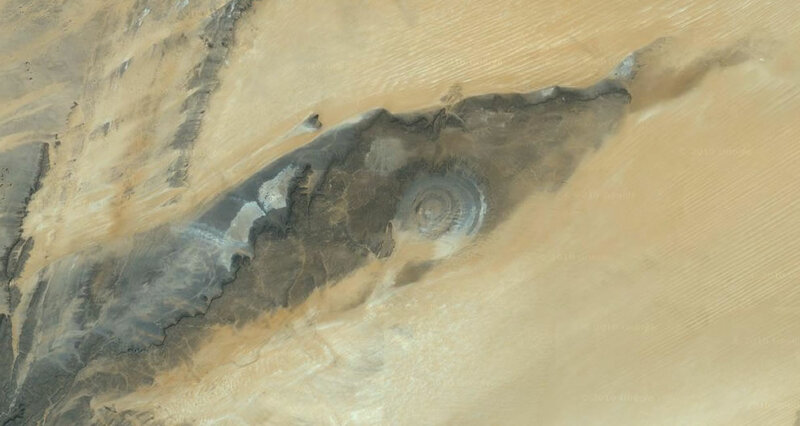 Are there any visible striations in the layers within the structure which might indicate that it might have been formed by a massive water whirlpool? A whirling volume of water loaded with silt and sand could account for the walls of the structure to be so perfectly circular. The idea of a meteor striking an underwater volcano sounds feasible. Such a blow could possibly have blown a hole deep down in the side of a volcano vent, allowing water to flow into a constantly receding underground water reservoir. Subsequent drainage could have removed all evidence of having been a meteoric access point to a water table by having been filled in with silt and sand. Have any tests been done on the floor of the eye regarding silt layers, underground water flow, etcetera? Just curious. This is a new comment. It expands on the possibility of having been the result of a meteor impact and whirlpool theory. have always wondered where this was, during ww2 my father flew over it and snapped a picture from a b24 I have a black and white and it is a total match. I talked about this way above (3/12 – 4/12). 1) It is accepted that this is not a direct impact (similar to Arizona Crater etc). There simply is no geological evidence (lack of Coesite). 3) Geologic dome does not explain #2. If you zoom into the center of the eye there is what looks like some ruins still half buried and can’t find anything on them. This is an impressive and mysterious structure. Catalina, thanks for your comment. My initial posting on this was last year. 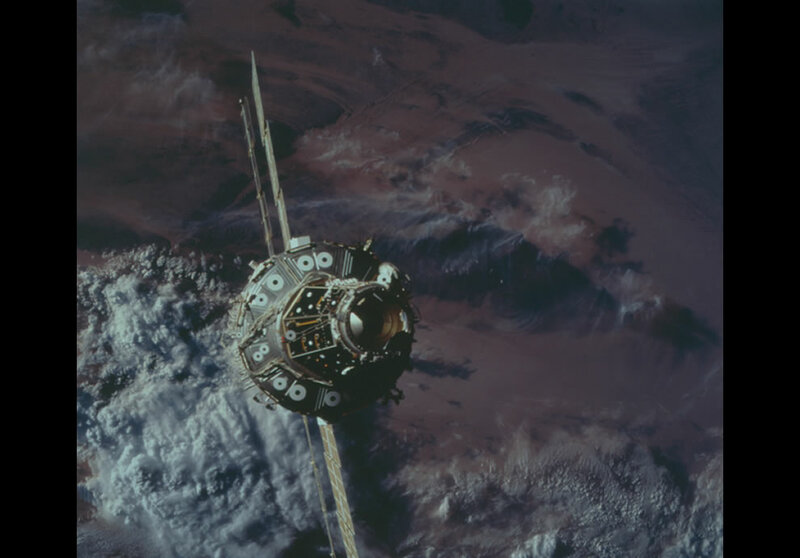 I used to be part of a US Air Force flight crew when we first saw this back in 1975, flying from the Canary Islands to Mali during an Air Force mission. We actually saw two of them. The other one is much smaller than this one. It had two rings of rocks. The inner circle rock formation was perhaps a few hundred to a 1/4 mile wide. The outer circle was just slightly wider, perhaps a half mile wide. We dropped down to a lower altitude to investigate. The mystery is that these rock formations were surrounded with sand and nothing else around it. At first, it looked like an old volcano crater sticking out of the sand. We looked and found nothing on our navigational map to indicate any volcanoes in that area. At that time, we were instructed by the military that if we see anything unusual from the air, we were ordered not to discuss it with anyone. This is not the first time we had seen unusual and mysterious sightings. On one of our over water navigational training flying from a base in Texas to the Azores, we also saw a strange and mysterious sighting in the ocean when we flew over the Bermuda Triangle. To this day, almost 40 years later, I am still wondering what is that I have seen. I dare not discuss it with anyone else lest they think I am “crazy” and just imagining things. I know what I saw. Even though I am now retired and have the freedom to discuss, I do not discuss these sightings openly in public due to being ridiculed. Nature is molding the landscape, it may create a earth Coriolis forces of wind blow east to west and also exact center of earth based on inclination. that point is good indicator of global warming, it will determine future atmosphere. Is it a sight seeing place? Can we visit it? How? This landmark has been sketched into the earth the day that the Sun stood still for 24 hours. There are clear marks of the refracted rays of the sun leaving both narrowing and expanding impressions on the landscape as the moon moved into and out of position. Well. If you are not going to reveal the truth to the world that this anomaly was created by the solar beam reflected off the moon when the sun slowed and came to a stop for a near 24 hours approx.4000 years ago, at least acknowledge there is no PHOTOGRAPH of the far side of the moon. and try to have a good day, living in your hypocrisy of lack of science.